Mopar Motors has a reputation for modifying, building and restoring a wide range of makes and models. So whether you have a PT Cruiser you want to modify, an old car in the garage you want to bring back to it's very best or build a hot rod from the ground up. 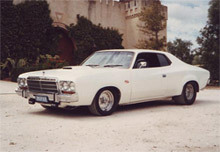 Some of the cars we have built over the past years from ground up restorations like the famous Chrysler VJ Hard Top 1974 Pearl white in colour were the driving force of the business, with a custom leather interior, modified body work and slick styling housing a big block 440 cubic inch hi-performance thumping V8 engine producing 440 bhp and its best ¼ mile time 12.2 sec it certainly got Mopar Motors noticed on the streets, on the race track and in the Street Machine Magazine back in 1988. Also known as Mopar Mauler. Other cars built were a 1956 Desoto Diplomat, 1957 Chevy Coupe, 1959,1962 Cadillac coupe, 1966 Chevy Impala 1964,1965,1969,1972 Mustang coupe, 1974 Jaguar XJ6, 1972 Ford XA coupe,1971,1972,1973,1975, Valiant Charges including 2 x 1972 R/T Chargers ,1974 modified HQ Monaro 1934 Ford Sedans, 1934 Chevy Sedans, 1928 Ford Tourers, 1977 Triumph Stag and a number of PT Cruisers, the list goes on and on even as a different line of interest we fabricated a horse drawn carriage just to see how far we could go in designing and fabricating.